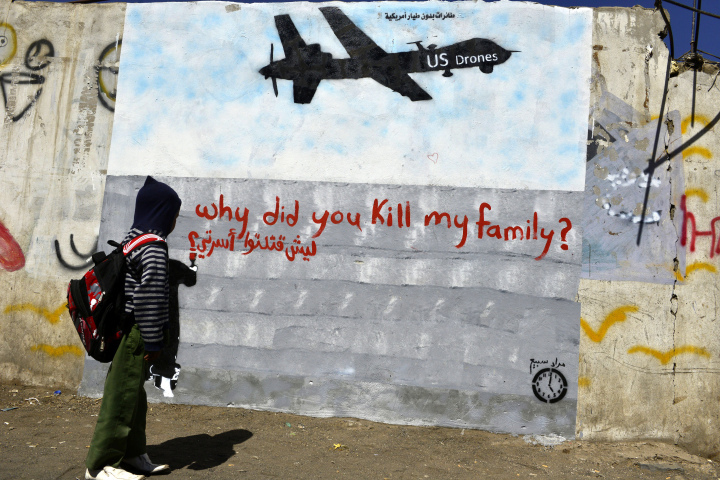 Both the Trump and Obama administrations have advanced two fictions over the last three years to obscure U.S. complicity in Yemen’s humanitarian catastrophe. From former Secretary of State John Kerry to his successor, Rex Tillerson, U.S. officials have insisted “this is not our war” and emphasize that a political settlement is the only way to end it. However, U.S. actions – consisting of continuous, unchecked U.S. political and military support for Saudi Arabia and the United Arab Emirates (UAE), which are leading bombing missions that indiscriminately target Yemeni civilians already struggling under Houthi rebel rule – hardly support this position. Three years of stalemate on the battlefield, mounting civilian casualties, and a blockade on humanitarian assistance for starving Yemeni civilians has finally brought this contradictory policy out into the open. Perhaps most importantly, this unquestioned executive overreach finally seems to be losing its potency in Congress – which never authorized this contradictory and counterproductive policy in Yemen, but has also yet to stand up against it. With the introduction of a bipartisan War Powers Resolution (S.J.Res.54) to force the withdrawal of U.S. military personnel supporting the Saudi-led coalition’s bombing campaign in Yemen, Senators Bernie Sanders (I-VT), Mike Lee (R-UT), and Chris Murphy (D-CT) have moved to re-assert Congress’ role in war-making decisions – a bold action in today’s world where congressional silence on executive war-making has become the norm. By forcing a debate and vote to stop U.S. armed forces from participating in Yemen’s civil war, Congress is not only upholding its constitutional role as the sole body that can declare war, but also forcing the Trump administration to change its calculus by putting its words into tangible action to end the conflict. The Sanders-Lee war powers resolution on Yemen is not only about Congress’ Article I powers, but should also be seen as leverage for the administration to push for peace and reinvigorate the stalled peace negotiations. Rather than promote the kind of de-escalation that could eventually yield peace talks, the United States continues to literally fuel the coalition’s war effort. The U.S. Air Force refuels coalition planes in mid-air in between bombing runs over Yemen, while U.S. Central Command furnishes missions with targeting intelligence and assistance. All of this support enables the high tempo of airstrikes that target civilian sites at least a third of the time. These attacks on civilians and civilian objects are a key driver of Yemen’s horrific humanitarian crisis, and remain the leading cause of civilian casualties in the country. U.S. support doesn’t stop there however. The efforts of U.S. diplomats at the UN Security Council to shield Saudi Arabia and its allies from accountability for its myriad violations of the laws of war, coupled with U.S. military support, allow the Saudi-led coalition to continue its intervention in Yemen indefinitely. 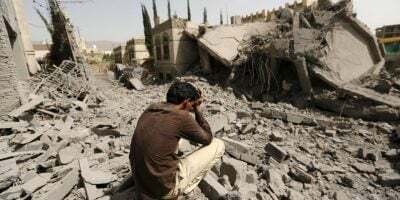 With such unconditional U.S. backing, the coalition has no incentive to reduce civilian casualties, end the bombing campaign, ease the humanitarian crisis, or push the increasingly isolated President Abd Rabbuh Mansour Hadi to engage in serious negotiations to end the war. Absent essential U.S. military support, Saudi Arabia and the UAE would have to consider all three, or risk further sinking themselves in an endless quagmire that risks spilling more blood and treasure for a conflict that has no military solution. By ending U.S. refueling and targeting assistance, S.J.Res. 54 should serve as a wake-up call to the Saudi-led coalition that it can no longer expect unchecked U.S. support for a military stalemate and it must diplomatically engage its adversaries. Ending U.S. military support, which is essential for the continuation of the coalition’s air campaign, should remove the incentives for the coalition to pursue a military-only strategy in Yemen. With the campaign costing Saudi Arabia an estimated $66 million a day – money that’s supposed to undergird domestic reforms, not trap the country in a Vietnam of its own-making – the end of U.S. material support could significantly change the coalition’s cost-benefit analysis. In its unconditional backing of the Saudi-led coalition, the Trump administration has promoted an “escalate to de-escalate strategy” in Yemen and resisted having a frank conversation with its allies on steps to end the intervention. Thus far, the United States has only been willing to exert temporary pressure on Saudi Arabia to loosen its blockade, which is less a step toward peace than one to alleviate international outrage and create political space for the coalition to continue its military campaign. Yet the lesson of the administration’s rhetorical pressure on the coalition about the blockade is an important one: It has changed the Saudi-led coalition’s behavior, albeit temporarily, pushing it to announce temporary openings of Yemen’s most vital port and to hastily publish a Booz Allen Hamilton-drafted humanitarian plan. While woefully inadequate for addressing the crisis, this movement demonstrates the coalition members’ sensitivity to international criticism, particularly from the U.S. If provisional rhetorical criticism gets provisional tangible improvement, imagine what a congressional threat to end all U.S. military support, which would place the war’s full burden on the coalition’s shoulders, could achieve. Through this legislation, Congress is applying the lesson the Trump administration has failed to learn so far: U.S. military support is an important lever for pushing for peace. Yet such leverage won’t mean anything if the administration fails to utilize it to end an unwinnable military intervention. Thankfully, the Senate bill’s bipartisan sponsors are willing to force the issue with the administration by threatening to end unconditional, unauthorized U.S. military assistance to the coalition. The administration should use this threat to stop U.S. support to communicate to Riyadh that its international isolation will only increase absent genuine de-escalation and renewed peace talks. Instead of lobbying against the resolution, the White House should embrace S.J.Res.54 as a tool to influence an ally, which this administration is reluctant to publicly rebuke. Eric Eikenberry is Director of policy & advocacy at the Yemen Peace Project, Follow him on Twitter @YemenPeaceNews. Kate Kizer is Policy Director at Win Without War Follow her on Twitter (@KateKizer).